Finesse has never been important for hard rock miner Rick Batista during his years of underground drilling and blasting. But with this job at the Glenwood Caverns, it's a top priority. “It gets pretty technical down in here,” said Batista. He points back up the newly formed tunnel that passes beneath Iron Mountain at one of the live stalactite mineral formations hanging from the ceiling of the historic Fairy Caves. “We had to trim the wall around there without breaking it,” he explains. Batista has been involved in numerous mining projects around Colorado, including the reopening the Colorado Yule Marble Quarry outside the town of Marble in 1990. Starting last fall and continuing through this year, he's heading up a new project at the Glenwood Caverns Adventure Park to create a new loop walking tour. Once completed, the underground loop will bring tours in the caves in through the existing upper portal, through a series of previously inaccessible rooms, and out a new lower portal near the Visitor Center. Caverns Adventure Park co-owner Steve Beckley said the project has been in the planning stages now for about four years, and is aimed at expanding the park's visitor capacity. Currently, the 70-minute walking tour passes through the upper cave sections via a single portal and heads out toward Lookout Point. The tour then retraces back along the route to the same portal. The new counter-clockwise loop tour will allow for a continuous flow of tours, expanding the capacity from 84 people per hour to around 400, Beckley said. That will significantly lessen what can be a three-hour wait to take the tour, especially during peak summer periods. The new cave sections are expected to be open for tours in 2013, though limited tours could be offered later this year, he said. The expansion is also part of an ongoing park master plan that is to include new rides and other attractions starting this year and continuing over the next five to 10 years, Beckley said. 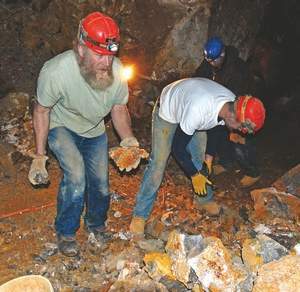 New discoveriesInitially discovered and mapped in the 1960s, the new cave sections that are being opened up for public viewing have been largely unseen until now, Beckley said. Some sections had been part of the park's wild tour offering, which involves crawling and squeezing through tight spaces to access areas not included in the historic cave walking tour. “About 90 percent of it has not been seen before,” Beckley said of the roughly 600 feet of new passageway. The tunnel will connect the Bedroom and the Register Room, and pass through the newly opened G7 and Pendant rooms along the way. Finding a way between the rooms was the initial challenge. As the openings are discovered, it's a matter of digging in and seeing how far it goes. “You may work for weeks on it just trying to get it to go anywhere,” he said. Beckley's two sons, Shane, 12, and Stenar, 10, have been a big help along the way, he said, squeezing through some of the tighter spots to scope things out. Once established, the tunnels need to have at least six or seven feet of clearance for the walking tour. The larger rooms also need to be cleared of rock to allow for the tours to pass through. For instance, the Pendant Room had about six feet of clearance when it was discovered. It now has about 14 to 15 feet from floor to ceiling. “You just have to be so cautious when you're clearing all that rock out, because you don't want to destroy the delicate cave structures,” Beckley said. The work involves crews of four to eight at a time working the drills and hauling out the smaller bits of rock in wheelbarrows. Explosive charges are placed in the bigger rocks to break them up before they can be removed. As the project progresses, Beckley said he is considering inviting volunteers in to help with the hard labor, in exchange for food and some exploring time. Historical perspectiveWhen the new loop section opens up, Beckley would like to start a “history of the caves” theme tour, including guides dressed in period attire from the late 19th and early 20th centuries. “We can go in and show how the old Edison bulbs were first used to light the caves,” he said. According to historical documents, the property overlooking Glenwood Springs on the side of Iron Mountain was owned by the Darrow family, which homesteaded there in the late 1800s. It was Charles Darrow who coined the “Fairy Caves” name. Fueled by the active underground mineral hot springs that run through the mountain toward the Colorado River, the extensive cave system features thousands of natural formations, including stalactites, stalagmites, soda straws, cave bacon and flowstone. The Darrow family offered the first public tours of the caves in 1886, and most of the current paths used for today's walking tour were developed around 1895. Public tours were halted during World War II, and the property was later acquired by POW, Inc. in 1961, shortly after the lower cave sections were discovered. However, the caves were only open to spelunkers by special permission for the next 38 years. Public tours did not start up again until the late 1990s when Steve and Jeanne Beckley obtained the necessary permits to re-open the caves to the public and build a theme park as a local tourist attraction. Booming businessThe five-year expansion plan at the Caverns Adventure Park is part of a larger effort to offer more things for visitors to do as the theme park grows in popularity. Cave tours grew to 85,000 visitors last year, and total park attendance was up 15 percent to 150,000 people in 2011. The prior year saw an 8 percent increase in park attendance, Beckley said. “Tourism is what seems to be growing the most throughout the valley, even as construction and oil and gas activity remain down,” he observed. “I'm very optimistic about Glenwood Springs and tourism right now, and if we didn't feel poised to attract more tourism we wouldn't be doing this,” Beckley added. Additions to the theme park this coming year are to include a new Rocky Mountain-themed carousel, with horses, bears, deer, elk and other wildlife common to the region. There will also be a smaller, family friendly coaster installed as a companion to the existing Alpine Coaster, and a western-themed Ferris Wheel. An amended land-use permit request currently before Garfield County planners will also allow for future attractions to be added to the park in the coming years. “As the number, quality and appeal of the activities and attractions at the site have expanded, more and more guests are visiting the park for the total experience, not just the caverns tour,” according to the proposal, which goes before the county planning commission this Wednesday. The expansion plan is also to include an increase in capacity for the tramway system that transports visitors up to the park, from the current 12 cars up to 36 eventually.